Warning: This post has almost as much shame and disaster as Pop-N-Dog. I’ll admit that sometimes in church I get distracted. (God loves me anyway – he made me, y’know.) 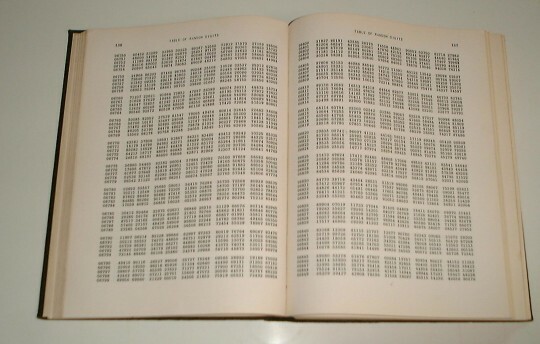 Many Sundays back I was singing a hymn and the thought popped into my head, “Y’know what would be funny? A cake shaped like a clerical collar. Isn’t October Clergy Appreciation Month?” Great. The whole rest of the service was spent trying to put that thought off until a more acceptable time. I mentioned it to Lloyd after church and he thought it was funny enough that we stopped by the cake decorating aisle at Wal*Mart and looked at fondant. I’m a failure with fondant, so I hemmed and hawed and decided to wait. 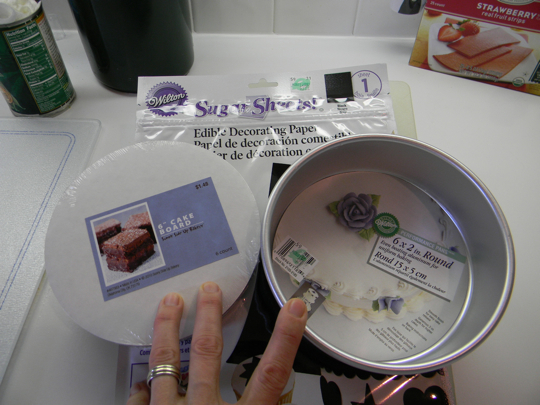 A week later I went to Lincoln and bought some stuff, including something made just for me – edible construction paper! 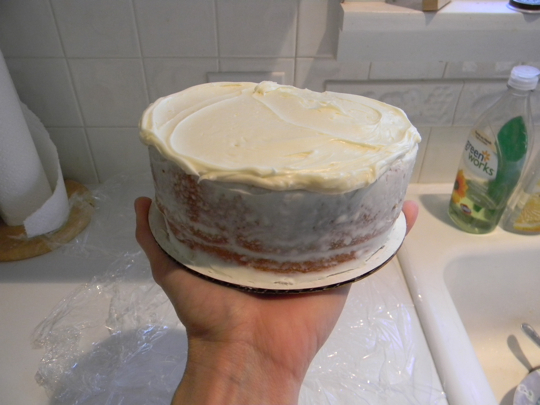 A week after that, I actually made some cake. I lined the bottom of the pan with a parchment circle and even ‘crumb-coated’ them so when I put on the final frosting it wouldn’t make a big mess. Thanks, YouTube, for your educational services. Ummmm…. 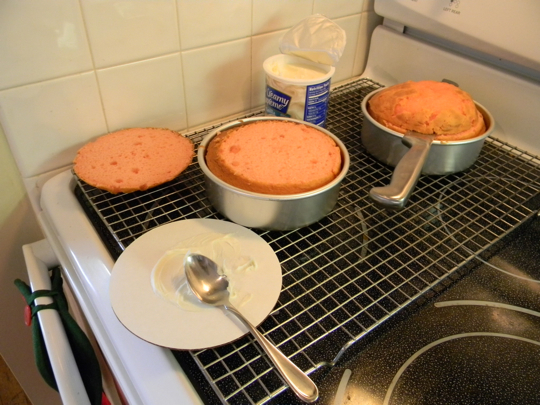 then the cakes sat in the freezer – unwrapped – for days until I remembered to wrap them. (This project was slow going.) I was pretty sure they were dried out and inedible, but since I knew from the get-go that these were just prototypes, I sallied forth. I frosted them, then cut the sugar sheet out. 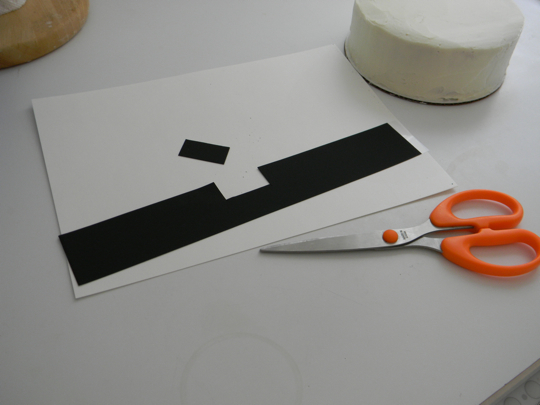 A paper cutter worked just dandy, and scissors cut out the notch. 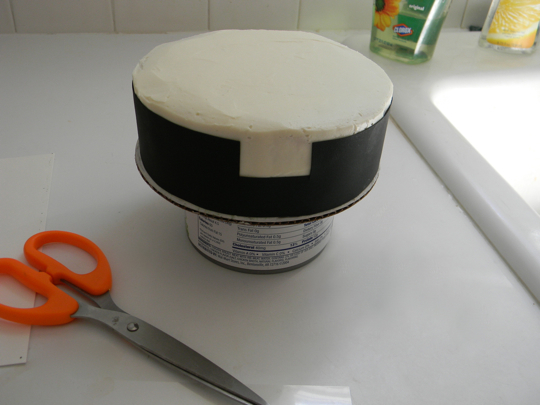 I wound up frosting two cakes, but only making one into a clerical collar, and that was two weeks ago. We have three pastors at church, so if I want to do this for real, going by my timetable I need to start next June so they’ll be ready by next October. Ahhhh….. Lauren’s world – where crazy ideas go to die. What am I going to do with two dried-up frozen cakes? Maybe cake pops…. Edible paper?!? How have I not used that in a chapel message yet? So you baked the second cake in a cooking pot??? And Jerome will take Cake #4 since you have 3 pastors. Okay then, we’ll expect you sometime this month. It’s the serrated knife sticking out, but you’re right -- it does look like a cooking pot. If Jerome likes old, dry cake -- I’m his baker. Lauren--You are a genius!! If you ever move to Baltimore, Charm City Cakes will surely have a job for you! Now what would I like on my neck cake??? 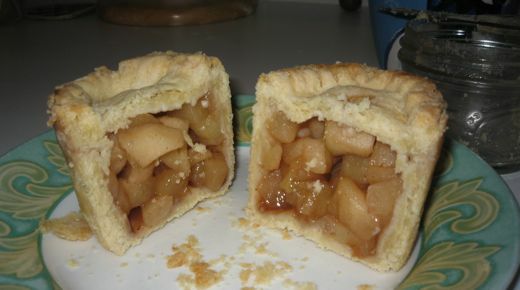 Well, beings it is the Halloween season….how about a nice bite. Muahhhh! I know a “cleaner” that could take care of your problem. Once Jeremy could not find the actual plastic tab for his clerical collar so he used a folded up Taco Bell coupon. That really has very little to do with your amazing cakes but never fails to make me laugh -- out loud -- even when I’m in a hotel lobby like I am right now, sitting all alone. Happy Pastors Appreciation Month to Jeremy! Ha! That is classic! When I was a kid I would take my dad’s ‘around-the-neck’ one and try to bend it into a nurse’s hat.